Team Canada began its quest for a fifth straight Olympic gold with a speedy 5-0 win over the Olympic Athletes from Russia. The win was spurred on by three unanswered goals in the second period to break open a scoreless game. Rebecca Johnston led the way with two goals and an assist during the evening. Melodie Daoust had two goals and captain Marie-Philip Poulin contributed three assists. "It’s nice to see those goals in, for sure," said Johnston. "A lot of the girls had really great opportunities and mine ended up going in. As a team, I think we did a really good job of creating chances." "We have a lot of talent on this team, a lot of speed, a lot of skill," said Meghan Agosta. "We have a lot of people who can contribute, and that’s what we need. We need everybody going for us to be successful. Tonight, with putting up five goals, I think it’s great." 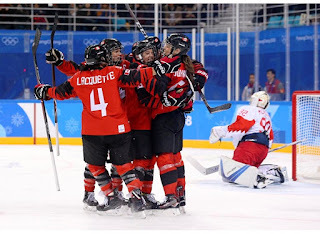 Although the team is called the Olympic Athletes from Russia for sanction reasons, Canada had played Russia eleven previous times in Olympic and Women’s Worlds competition, winning all games and never allowing more than one goal in any game (five shutouts). Today, under a new name, nothing had changed. "I think we can do more than match Canada for one period," suggested Olga Sosina of OAR. "I think if we could score on the chances we created, maybe things would have been different. After all, scoring a goal gives everyone a lift, and that can change a game. If we’d scored on our chances the game might have turned out very differently." Ann-Renee Desbiens stopped 18 shots for the shutout. It was her first blank sheet playing for her country. She played three times at the WW18 in 2011 and three more at the 2015 WW, winning silver each time but without recording a shutout. "It feels pretty good," the Canadian goaltender enthused. "It’s really nice to get it out of the way. The first few shots, you’re really excited, maybe a little too much. But I settled down as the game went along. It’s been a dream to wear that jersey since forever, so it’s nice to get that start and finally make it come true." Canada fired 48 shots at the duo of Nadezhda Morozova and Nadezhda Alexandrova. Nadezhda means hope in Russian but there was little hope to find back into the game for the OAR team. "We played well on defence but when we made mistakes we gave up goals," said OAR's Maria Batalova. "Physically it’s tough because they’re a little bit quicker than us. They were playing with four lines and we had three, so we got a bit tired towards the end. But of course we tried to play hard against them." Canada had by far the better of play in the opening 20 minutes but couldn’t convert until early in the second. Johnston fired a quick shot in the slot after a nice pass from behind the net by Brianne Jenner at 1:55. That goal inspired teams to open up a bit, and Valeria Pavlova came right back and nearly tied the game on the next shift. Only a nice save by Ann-Renee Desbiens kept it a 1-0 game. Soon after Canada went on the power play, and just eight seconds later Johnston’s point shot was beautifully tipped in front by Haley Irwin at 4:13. Canada made it 3-0 late in the period on a nice passing sequence which started with captain Marie-Philip Poulin making a twirling pass outside the OAR blue line to Agosta streaking down the left side. Agosta waited for Daoust to skate to the top of the crease and fired a great pass which Daoust redirected in at 15:51. "I thought in the first period we had a lot of great chances," Agosta continued. "We just needed to outwork the goalie. Come the second period, we just ended up burying those chances and kept going. We didn’t get frustrated at all." Pavlova was OAR’s best player. Indeed, she had five of the team's 12 shots through 40 minutes of play and six in the game. She made two toe-drag moves in quick order and fired another good shot that was expertly blocked by Desbiens. Pavlova had previously helped the Russians win bronze at the 2013 and 2016 Women’s Worlds. Johnston made it 4-0 midway through the third on a five-on-three power play, roofing a gorgeous shot from a bad angle over the shoulder of Morozova. Daoust added her second of the game at 10:44 to put an exclamation mark on the score. "I’d like to thank our men’s team who came to support us tonight," said OAR's Olga Sosina. "That was really great. I’m sure that when we get some free time we’ll be happy to go to some of their games. For me, it’s always good to get advice [from the men’s team], every suggestion is interesting to hear. It’s inspiring." "It’s honest hockey, blue-collar hockey, not being scared to get physical and get pucks in behind them and win footraces," said Canada's coach, Laura Schuler, herself a player with Canada from 1990 to 1998. "The Olympics are about heart and soul and giving it your all. I think that’ll be important for us moving forward." Both Group A teams have a day off tomorrow. Canada plays Finland on Tuesday afternoon while OAR takes on the U.S. in the late game.